Karen Silve developed an interest in Post-Impressionist and Fauvist painting, and they informed her early figurative abstractions. She studied in the graduate painting and design programs at the University of Denver, creating abstract work that was inspired by the landscape and by the color lessons she learned in France. Later, the Abstract Expressionist painters Willem de Kooning and Joan Mitchell, and the German artist Gerhard Richter became important influences on her work. In 1993, Silve moved to Portland, Oregon, worked in graphic design and began to explore painterly process in a series of meditative paintings. In the late 1990s, she created two extended groups of paintings, first the Musician Series, and then the Cellist Series. Both series focused on players with their instrument, and on a feeling for music expressed through abstracting the human figure, gestural brush strokes and vibrant color. After this she moved on to rhythmic, calligraphic brush strokes and drips of paint. Evolving from this period is the ongoing series of abstract paintings that Silve continues to create. 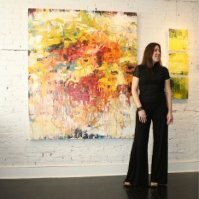 Silve has exhibited her work extensively in solo exhibitions including at the Portland Performing Arts Center, the Forsyth Center Gallery at Texas A&M University, the Visual Art Center of Northwest Florida, the Tuscaloosa Performing Arts Center and the West Linn Public Library in Oregon. Group exhibitions include those at The Institute for American Universities, Aix-in-Provence, France, the Jemison-Carnegie Heritage Hall, Talledega AL, and the Art in Embassies Program, Doha, Qatar. She currently maintains studios both in Portland and in the south of France.